Harvest mice al fresco – filming small mammals comes with a whole set of problems. Ask any wildlife cameraman about filming small mammals and almost all will tell you that it makes sense to film them in a set. What do I mean by ‘a set’. Well, just think of ‘Silence on set please!’ It’s no different to the movies, where you might find a whole street recreated indoors. Feature film producers and directors go to such lengths for all kinds of reasons, but the overriding reason is control. We film small mammals in sets for the same reason, control, and I’ll share a few of my experiences here. have you ever seen a harvest mouse? Here’s the first reason for filming a harvest mouse in a set. It’s almost impossible to see a harvest mouse in the wild, let alone film one. I for one have never seen a harvest mouse in the wild. Most people I know, and these are naturalists who spend a lot of time watching wildlife, have never seen a harvest mouse in the wild. One or two have seen,’Tails disappearing quickly into the grass,’ but not much more than that. Well I’m sorry folks, but cryptic images of tails disappearing into the grass don’t make good TV. I challenge any wildlife cameraman to film a meaningful sequence of harvest mice in the wild. And I’d be surprised if there were any challengers. So we come to sets. In the case of harvest mice the set will represent the kind of habitat you find the mice in naturally. Harvest mouse habitat is surprisingly varied. I chose tussocky grass and the type of old fashioned meadow that is rarely seen nowadays. You could make a massive set where the mice can frolic in a temporary home of estate-sized proportions. By doing that though, you may never see them again and wonder whether this tactic improves on filming them in the wild. For this task I made a small set and filled it with tussocky grass plus stems and seeds. Sometimes you have to construct a large set otherwise your subject might not exhibit the behaviour you want to film, but here a small set was fine. If you film indoors you will have to use lighting. Lighting small sets is not that easy, particularly if you are determined to create an authentic look. Purely from the lighting standpoint you might find it difficult to create the look of broad daylight indoors, and there are other problems too. Multiple light heads do show up in the eyeballs of small mammals, and that is a real giveaway. That said, on the big close ups of these mice you can see the reflection of me and my wife. So how natural is that! I suppose a big budget series might replace the eyes of the mice with digital versions. Film a set indoors and you will have more control. Also, you will not have to contend with the unpredictable nature of the weather. And most importantly you will be glad to have those tea making facilities to hand. Filming a set outdoors comes with several built-in advantages. The sun is your lighting, and although it doesn’t always shine on TV, you can schedule your filming to fit the weather. A gentle breeze adds authentic life to your set, gently moving blades of grass and other vegetation. Sometimes the wind is a curse: it can spook your animals and destroy your set. I’d rather not think about that. One big advantage is having a large natural background. This can give your set a sense of place and scale that is difficult to achieve indoors. At this point it makes sense for me to describe how I went about it with this set. Now, the notion of control and small mammals doesn’t make any sense, and understanding that is a good starting point. So the idea of taking harvest mice al fresco is enough to make you nervous from the get go. Controlling your subjects, in particular preventing their escape, is a high priority. I don’t like filming through glass, and I’d go so far as to say it’s nearly impossible to achieve outdoors. Aquarium glass is optically poor, so don’t film through that unless you really have to. Worse, you will find reflections practically impossible to eradicate when you are working outdoors. My goal here was to make an escape proof set with no glass at all. To do that I made a small island surrounded by a moat without water, and hopefully the pictures show that well enough. This idea, if you use it well, works with harvest mice. But I wouldn’t try it on this scale with wood mice, yellow necked mice or house mice. Harvest mice al fresco – the idea is to place the set in front of a suitable area of habitat. Then you can position the camera so that your set looks as if it is a natural part of that habitat. In theory this all seems brilliant, and, in theory, it is. In practice it is a little more tricky and may take some time to organise. Sort out this challenge and you are ready for action; but are the mice ready for action? This set is about 2 feet off the ground, which is workable with short tripod legs. Build the set any higher and you will find it difficult to integrate into the background. Using this set up your set habitat surface is 2 feet higher than ideal, and you may have to find a sloping piece of natural habitat as the background. Another option is to dig a huge hole to accommodate the set, tripod and camera. This could bring the set surface down to actual ground level, but the wildlife trust weren’t too keen on that idea! Who knows? Harvest mice al fresco will behave as they wish. I’ve had individuals that do nothing but climb, and others that do nothing but hide. Some just want to escape and others just want to sleep. Patience and understanding, the watchwords of the wildlife cameraman, is what you need. In truth, a set will be a new experience for these little mammals, and after an initial period of nervousness they will get on with life. All in all this method sort of worked, and luckily I didn’t have to film any particular harvest mouse behaviour. Here is one of the shots and hopefully it will all make sense. Main lenses – Samyang 100mm macro and Lumix 14-140mm. Harvest mice can be bought as pets and are very easy to keep. Another experience of filming small mammals. Just when I was saying that I didn’t do much wildlife cameraman hide work these days something cropped up. This is more about putting your hide up than the subject matter, suffice to say that it was a male cuckoo calling from the top of a pine tree. There are many different types of hide that can be used for filming: everyone has their favourite, but this one isn’t mine. It’s a sacrificial hide, one that could be left where it was erected until it rotted away and became part of nature. Except of course all of it wouldn’t. At some point in the future a bemused forester would wonder why there were four aluminium poles sticking out of the ground in a vague square shape. This isn’t rocket science, just some anecdotal thoughts about putting your hide up as well as you can. Here, I had no idea how long I would be in the hide, but with a short break in the middle it turned out to be from 7.30 a.m. until roughly 5.00 p.m. That’s quite a long time with plenty of potential for discomfort. From a wildlife cameraperson point of view this is normal, and although discomfort is par for the course it is true that your concentration will be reduced if you are constantly uncomfortable. I didn’t do a great job on this occasion, making the mistake that I wouldn’t be in the hide for very long. Chance would have been a fine thing. Because of that presumption I put it up quickly with a very saggy roof (see photo). When you have the roof of a hide constantly chafing the top of your head it is so bloody irritating. No wonder water boarding is used to extract information from people, as anything constantly annoying the top of your head is ****ing torture. It’s one of those hides without cross members between the tops of the poles, so I was relying on getting the poles in a pretty good approximation of a square, then using guy ropes to pull the whole thing as tight as possible. Failed. Once in the hide it is pretty bad form to come out, so I scrabbled around for any handy sticks to prop up the middle of the roof to no avail. That was the first problem. The second was the viewing porthole. It was always possible that a cuckoo was going to land in a tree in front of me without calling, so I had to constantly visually monitor what was going in. This is very difficult when you’re bending forward and looking up steeply. One result of cocking this up was a very stiff neck for several days – luckily my wife is good at massage! Another error: it might be a dead calm day when you get into a hide (it often is in the UK at dawn) but always expect the wind to get up. Where I had the camera in relation to the filming port was wrong. 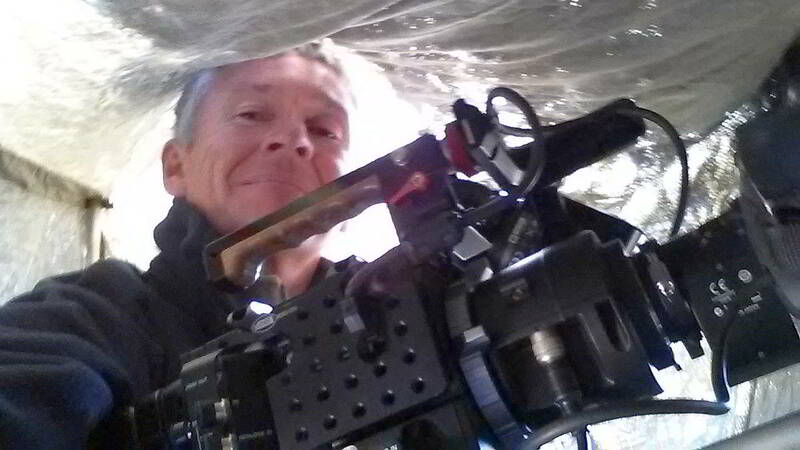 You have to be able to cover all of the likely filming spots with minimal pressure on the lens from the hide’s canvas. I could get the lens on all the possible perches, but the extreme angles necessitated some pressure on the lens from the lens port. It’s not so bad if there is no wind, but the moment the wind starts to blow the hide canvas moves, if only a little, and it WILL vibrate the lens camera combination, and that is not good. If you were to look at the picture in isolation I would forgive you for thinking I was working on a documentary about washing lines. The cuckoo didn’t turn up but called tantalisingly from miles away. Who said being a wildlife cameraman was easy?